April is a very special month here at La Cocina de Leslie. This humble little blog will be 3 years old on the 18th. So to celebrate this joyous occasion, this month's ingredient for The Food of the Month Club is one I hold near and dear to my heart. And it also happens to be my last name...Limón! The Food of the Month for April is LIMES! I hope you'll join me this month for The Food of the Month Club. 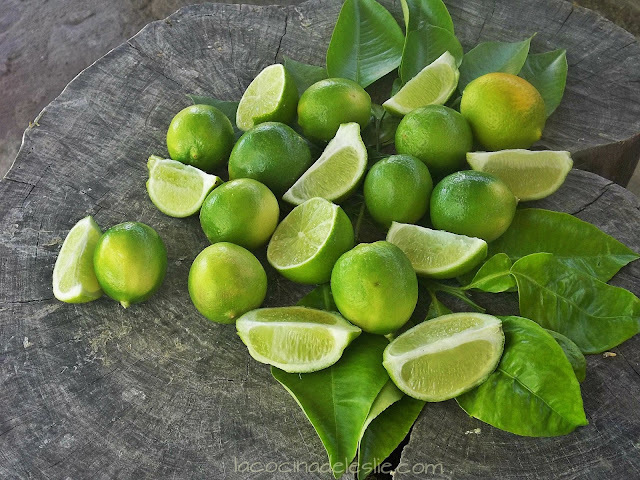 What are some of your favorite lime recipes? Cook up something delicious using Limes as one of the main ingredients. 4. Visit La Cocina de Leslie on April 30th for the Lime recipe round-up. It's always hard to explain to English speakers the relation between limes and limones. I think I have the perfect recipe for this event. I just need time to make it. Happy blogaversary! Take heart, Leslie, in recent years yellow lemons, called "Eureka" here, have appeared in a major grocery store here in San Miguel and Costco in both Celaya and Querétaro often have bags of them. I love limes, but sometimes I just need lemons. If you find out the Latin name or even some common name for "limas" let me know--I've been searching with no luck. Love that photo Leslie! Its beautiful! Now I'm craving anything with limes! Mmm! I have a lemon-lime pie recipe I might just have to make for Easter. Its sooooo good! This sounds exciting. Last month got too crazy and I didn't ever get around to the FOTMC, but those beautiful limes have me anxious for some summer flavors. Happy 3rd Blog Bday! Regarding limes... one of those foods I seldom use, but have small bottle of lime juice I splash in for fajitas. Guess I didn't grow up seeing cooks around me use them, so never learned. I believe the limas that you are talking about are known as "sweet limes" in California. Leslie, happy birthday!!! Three years blogging... that is awesome!!! We love this blog, is always full of ideas and mouthwatering recipes. Keep up the good work, my friend. Congratulations. I believe you're talking about lima dulce, sweet lime (Citrus limetta).